X-Bugs is a unique new game, combining luck, skill, and strategy. Your armies are microscopic mutated monsters. The battlefield is anytabletop. Each bug is represented by a plastic chip. Flip the chips to attack . . . practice helps! Each type of bug has a special power to attack or defend . . . each army has a different winning strategy! It's quick to play . . . eat the enemy bugs, destroy his bases, and win! Originating from Italy, this game has Steve Jackson's personal recommendation. "This is too much fun. It's a great design. The die-rolling gives randomness, the flipping requires skill, and there's a lot of room for strategy, especially in multiplayer games. I want to play again!" Each set comes in two color versions. 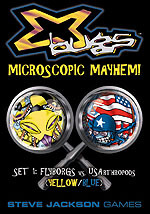 Any set is a complete two-player game (playing time is less than an hour), but with both versions you can play a 4-player game, or just a two-player game of Flyborgs vs. Flyborgs (or whatever). And all X-Bugs sets can be combined for bigger games! Sets 1 and 2 both have the same armies. Only the colors are different. This set has the Yellow and Blue chips. You can combine 2 sets of different colors so up to 4 players to join the fun. Other products in the "X-Bugs" series. This is a great action game based on Tiddly Winks. X-Bugs throws in a lot more strategy by assigning different abilities to different pieces. I recommend buying more than one set, because you will find yourself wanting to play with more than just two armies.